WHAT IS IT? The EZ Hitch table with umbrella slips into any 2-inch receiver. It provides a racer with a place to hold food, spare parts or tools. Plus, a 4-foot umbrella inserts into the center of the table for those hot days. CONTACT? (949) 307-6731 or www.ezhitchtable.com. WHAT STANDS OUT? Here’s a list of things that stand out with the EZ Hitch table/umbrella. (1) Installation. If your vehicle has a 2-inch hitch receiver, you can install an EZ Hitch table/umbrella to it. Obviously, it will work on SUVs or vans for soccer games or picnics, but it is at its best on the back of a pickup truck. The MXA crew took it out of the box, put the three pieces together (support bar, table and umbrella) and were sitting in the shade in less than five minutes. We kept the box in good working order so that when we got ready to pack up we could slip the pieces back into the original 40×19-inch packaging. (2) Table. The table mounts on a curved bar that clears the tailgate when the gate is down. The black rectangular plastic table slips onto the support bar. A thumb screw locks it in place to keep it from wiggling. Additionally, the table has rolled edges for more security and strength. The table can be mounted in line with the tailgate or at a 90-degree angle. We preferred to mount it at a 90-degree angle to allow easier access for sitting on our truck’s tailgate. The table has four recessed cup holders, which is good for drinks or chain-lube bottles. Hidden under the table is a bottle opener. The umbrella has a 1-inch PVC pole that inserts into the table’s center to allow the 4-foot umbrella to provide shade. The umbrella’s height is adjustable. (3) Usage. Most motocross racers who travel by pickup truck use their tailgate for multiple functions that aren’t always compatible with each other. Your friends sit on it. You keep your tools spread out across it, and you put wheel spacers, axle nuts and valve stems on it when changing tires. With the EZ Hitch table, we were able to have room for the freeloaders to sit and still had a place to put tools, drinks or goggles on. (4) Weight. The complete unit weighs 20 pounds. WHAT’S THE SQUAWK? Everyone who ever owned an E-Z Up awning has seen gusts of wind pick them up and fling them three trucks down. Thus, we have doubts about the EZ Hitch’s 1-inch PVC umbrella pole in high winds. 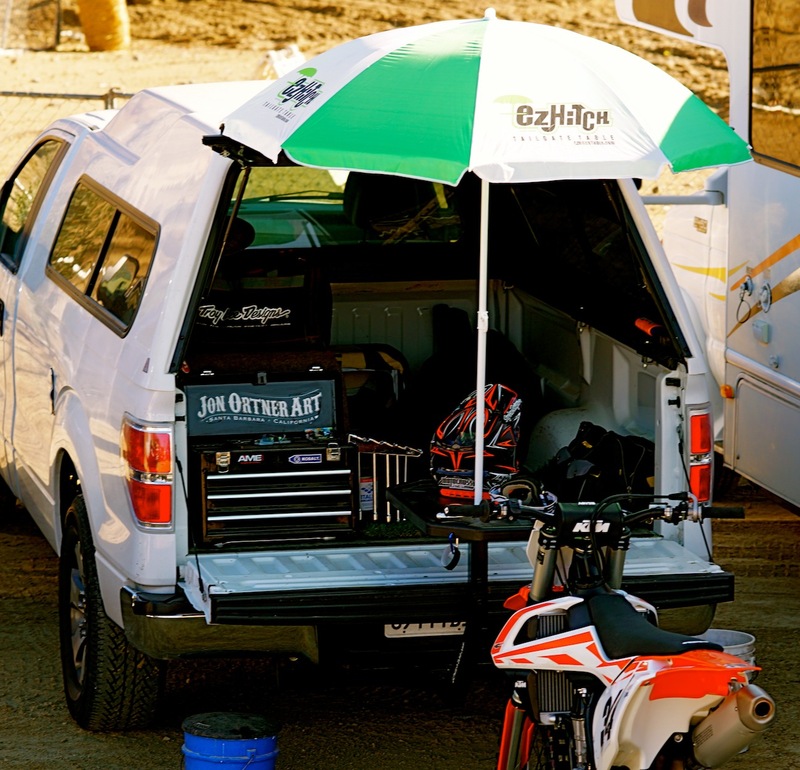 MXA RATING: This is a very good solution for a rider who doesn’t want to carry two folding chairs and a 40-pound E-Z Up awning for a day at the track. It makes more room in your truck bed, frees up places to sit, provides shade, and works as a lunch table and tool tray at the same time. As for the bottle opener, we’ll reserve judgment.